Faster than a bullet to the back of the head. More powerful than the Soviet Army. Able to leap vast wheat fields in a single bound. Look! Up in the sky! It’s a drone. It’s the S.A.F. It’s Stalin-Man! 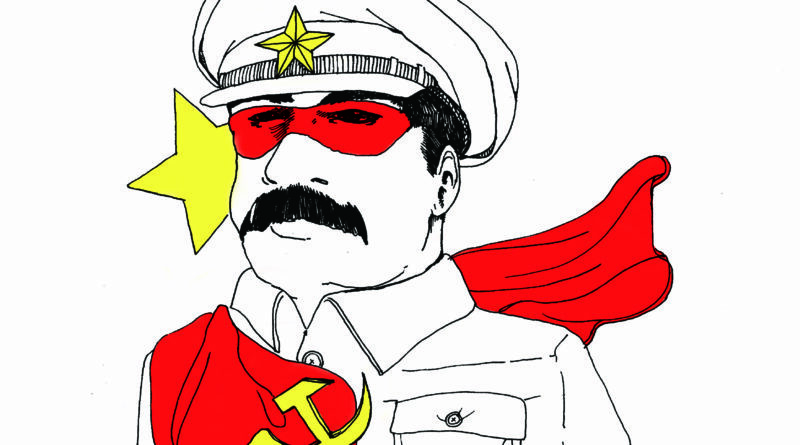 Yes, it’s Stalin-Man – a strange visitor from another country who came to Soviet Russia with powers and abilities far beyond those of mortal men. Stalin-Man – who can change the course of the mighty River Elbe, bend Sherman Tanks with his bare hands, and who, disguised as Joseph Stahl, mild mannered propagandist for a great Soviet Radio Station, fights the never ending battle for Democracy, Economic Equality, and the Communist Way. The famous Stalin-Man, while establishing peace and equal paycheques, also fights a brutal war against his arch-nemesis: the Dark Capital, who dreams of turning the world into a constant torrent of darkness, ruled by unequal generals that steal all of humanity’s resources and keep it to themselves. The Dark Capital will continue trying, but his efforts will be futile, as Stalin-Man will prevail and send him to the Internment Camps. As the Dark Capital yells defeat at Stalin-Man, he rises up, cheers rising from the hopeful souls of the Soviets. The newest episode of the Adventures of Stalin-Man, playing now. Remember what Stalin-Man says: Workers of the world, unite!